Can Republicans Stop Obama's Immigration Order? With President Obama's long-awaited move to halt deportations for millions of undocumented immigrants looking more and more like a fait accompli, congressional Republicans are trying to figure out if they can stop him. The White House has been promising the executive order for months over the protestations of GOP leaders, and The New York Times reported on Thursday that the action could come as soon as next week and affect up to 5 million immigrants. "We’re going to fight the president tooth and nail if he continues down that path," Speaker John Boehner told reporters late in the afternoon upon his reelection as the House's top Republican. "All options are on the table." At a press conference in Burma early Friday morning, Obama reiterated his plan to take action before the end of the year. "That's going to happen," he said. Yet he said Republicans still had an opportunity to pass immigration legislation in the lame-duck Congress, something Boehner has no intention of doing. If Obama acts this month, the biggest question will be whether the GOP tries to insert language into a must-pass federal spending bill to overturn the policy, thereby risking a government shutdown that party leaders have promised to avoid. The incoming Senate majority leader, Mitch McConnell, signaled he would not pursue that option. "We will not be shutting the government down or threatening to default on the national debt," he said repeatedly on Thursday in response to questions from reporters about the possible strategy. What could that mean? Will the House block other Obama requests, such as new funding to combat Ebola or for the fight against the Islamic State? That seems unlikely, and there isn't much else that the administration is demanding of Republicans that it otherwise would expect to receive in the lame-duck Congress. 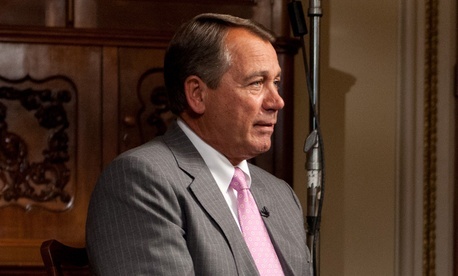 Until Boehner comes up with a better answer, the specter of another government shutdown fight will loom. Obama could also wait until after Congress passes the spending bill in December, a move that could limit the ways in which Republicans could respond.